Kepez Underground City, located in borders of Kepez Village, also tied to Mucur, the administrative district within Kirsehir is 14 km away from Ankara highway and 10 km away from Aksaray highway. 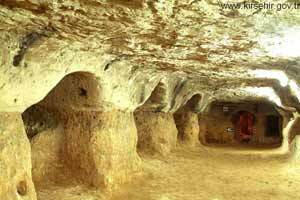 Kepez Underground City, one of the most orderly underground cities of Cappadocia, has always drawn visitors' attention. It consist of three groups of living rooms in the shape of rectangle also gallery and tunnels bounding these rooms. In 2002, the studies of excavation ad cleaning were done in the underground city, a big part of the underground city came to the surface and cleaned. Also, direction signs were placed with the illumination system.